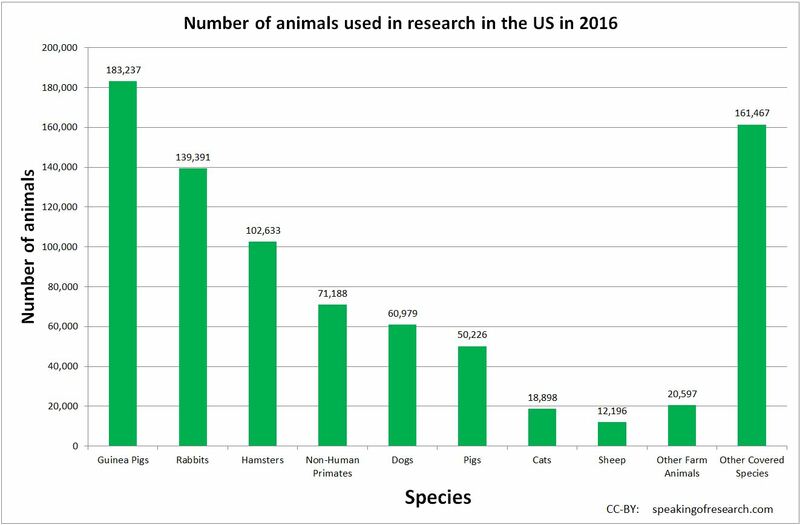 The USDA/APHIS has published the 2016 animal research statistics. 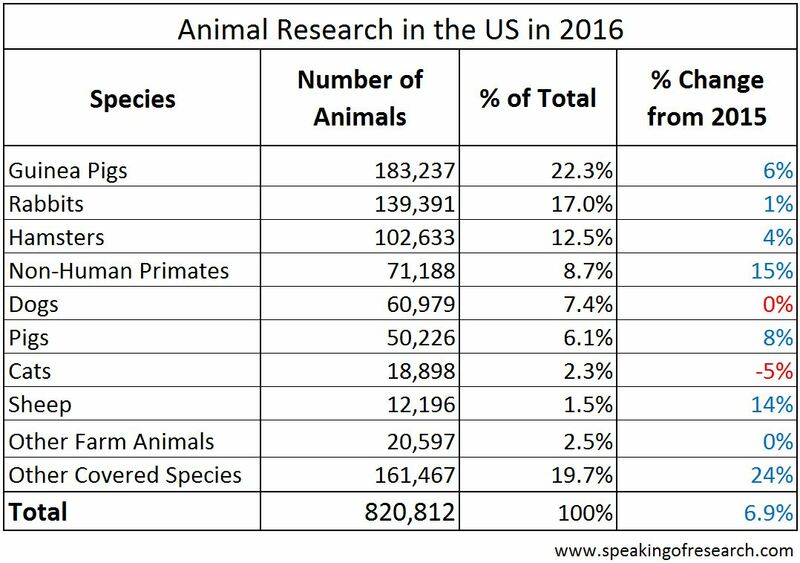 Overall, the number of animals (covered by the Animal Welfare Act) used in research in the US rose 6.9% from 767,622 (2015) to 820,812 (2016). This includes both public and private institutions. These statistics do not include all animals as most mice, rats, and fish are not covered by the Animal Welfare Act – though they are still covered by other regulations that protect animal welfare. We also have not included the 137,444 animals which were kept in research facilities in 2016 but were not involved in any research studies. The statistics show that 52% of research is on guinea pigs, hamsters and rabbits, 10% is on farm animal species, while 11% is on dogs or cats and 9% on non-human primates. In the UK, where mice, rats, fish and birds are counted in the annual statistics, over 97% of research is on rodents, birds and fish. Across the EU, which measures animal use slightly differently, 93% of research is on species not counted under the Animal Welfare Act (AWA). If similar proportions were applied the US, the total number of vertebrates used in research in the US would be between 12 and 27 million, however, there are no published statistics to confirm this. Comparing the 2015 and 2016 statistics there has been a small rise in the use of most species, apart from dogs (down 0.2%) and cats (down 5.2%). The largest rises were found in non-human primates (up 15%) and sheep (up 14%). Furthermore, it should be noted that this 6.9% rise comes a year after an 8% fall, putting the total number of animals used in 2016 slightly below the levels in 2014. 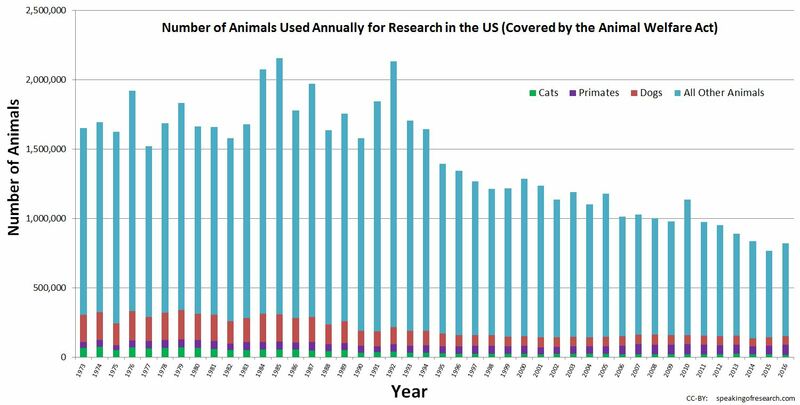 There has been a general downward trend in the number of animals used in the US over the past three decades; the number of animals used has more than halved (from 1.8million in 1986), with the use of dogs and cats down by over 65%. It is likely that a move towards using more genetically altered mice and fish has reduced the numbers of many other AWA-covered animals used. That said, non-human primates are one of the few species to have risen in use, from an average of 54,000 animals per year from 1977-2006, to 67,000 in 2007-2016. In the UK, where mice, rats, fish and birds are counted in the annual statistics, over 97% of research is on rodents, birds and fish. Across the EU, which measures animal use slightly differently, 93% of research is on species not counted under the Animal Welfare Act. If similar proportions were applied the US, the total number of vertebrates used in research in the US would be between 12 and 27 million. The annual statistics are one example of openness and transparency in animal research, but the last few years have seen a greater number of institutions from all over the world publically acknowledging their animal research in statements on their website. 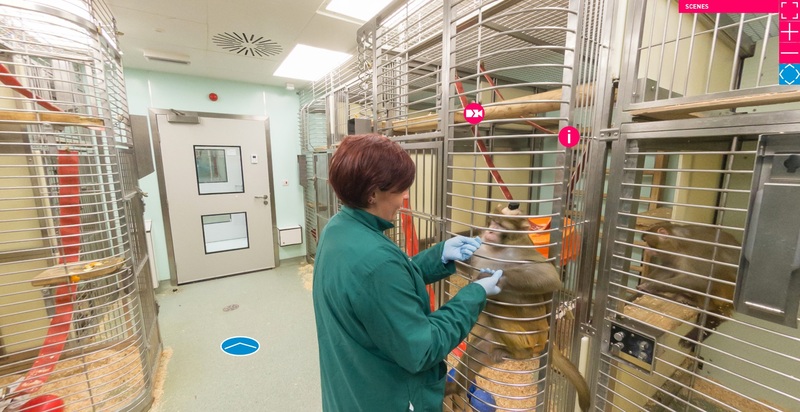 This week, two separate openness initiatives were announced, with Americans for Medical Progress launching their “Come See Our World” website of free-to-use animal research images, and Understanding Animal Research promoting a 3D tour of four animal facilities in the UK. Using the virtual tour you walk around real research facilities like this one at the University of Oxford. On the subject of openness, it was disappointing that neither the USDA, nor APHIS decided to press release the figures when they were released on June 7th 2017, or even mention them in the website’s News and Announcements. The US could follow the past example of the UK, where the Home Office, in conjunction with the Science Media Centre, held a press conference each year to announce the annual statistics and to offer experts to explain and discuss the numbers. Copies of the USDA reports from 2008-16 can be found on our US statistics page. We will continue to bring you the latest national statistics as and when they are released. Posted on June 19, 2017 June 19, 2017 by EditorPosted in News, StatisticsTagged 2016, america, Animal research statistics, Statistics, us. Next Next post: Research Roundup: Cholesterol vaccine in mice, zebrafish & osteoporosis, new cytomegalovirus treatment, and more! Looks like a fairly old center. The small cage in the center is a transport cage for moving monkeys around a lab. 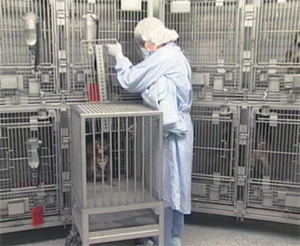 That said, we would love more images of US animal labs to be put into the public domain.